Reflecting the apparent acceleration of a troubling and long-running trend, the share of digital advertising earned by the nation’s newspapers plunged precipitously in the third quarter, according to an analysis of new data released this week. While total U.S. digital advertising expenditures surged 18% in the third quarter of this year to a record $9.3 billion, online advertising at newspapers rose a comparatively modest 3.6% to $759 million. Thus, the 1,300-plus dailies in the land collectively captured a mere 8% of the digital advertising dollars spent in the most recent three-month period – a sharp drop from the 10% of the market they held in 2011. As reported previously here, newspapers collected 15% of digital ad dollars as recently as 2007. But their share of the burgeoning market has tumbled ever since, owing to a lack of such popular products as targeted and search advertising. The Internet Advertising Bureau, a trade association, reported that digital sales in the third quarter were fully $600 million greater than the all-time record set in the second quarter of this year. The newspaper data is tabulated by the Newspaper Association of America, an industry-funded trade group. 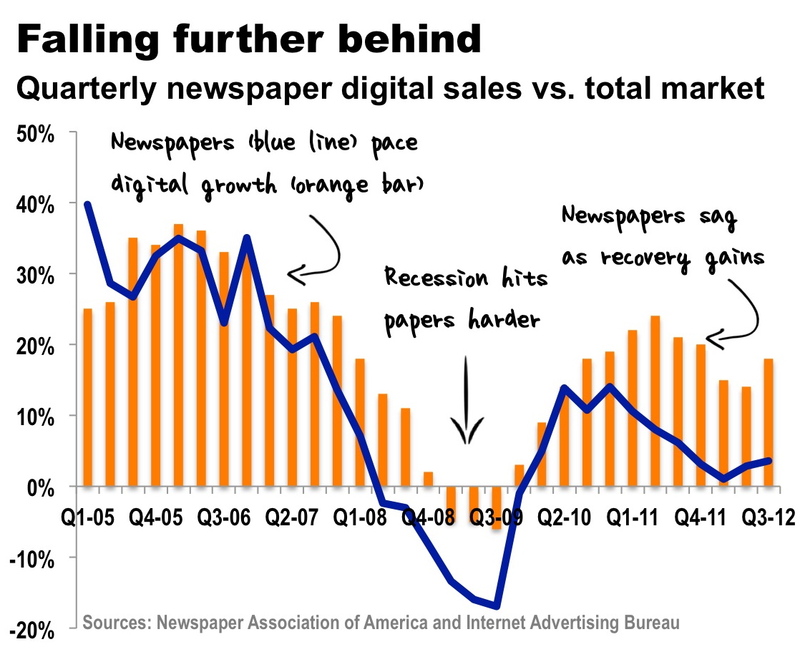 As illustrated below (click to enlarge), the growth of digital advertising at newspapers was reasonably competitive with the broader digital marketplace until the economy slipped into recession in late 2007. Ad expenditures contracted for both newspaper and native digital publishers during the downturn, and the year-to-year percentage gain in newspaper advertising actually matched that of the Net natives in the second quarter of 2010. Since then, however, the growth rate of advertising sold by the pure-play digital competitors has rocketed ahead of publishers. 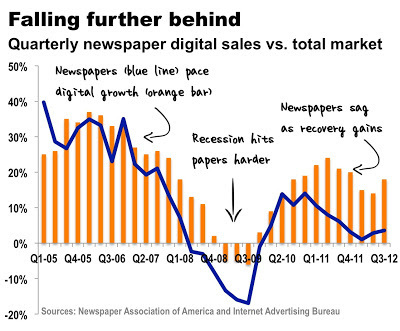 One reason for the sluggish digital recovery at newspapers is the collapse of advertising for employment, real estate and autos since the economy contracted. Prior to the downturn, publishers relied heavily on “upselling” web classified listings to print advertisers. While recruitment and real estate advertising remain weak, publishers still have not seen an increase in auto advertising even though vehicle sales are at a 4.5-year high. Another reason publishers are trailing the digital natives is that they generally sell run-of-site banner advertising that cannot be targeted to the demographics or interests of specific individuals. Unlike the ads appearing next to Google search results, which are explicitly targeted by the keywords selected by marketers, newspaper ads are sold in packages of 1,000 impressions at a crack. Unlike ads at LinkedIn or Facebook, which can be targeted with the enormous amount of personal information voluntarily contributed by each user, newspapers can provide little information to advertisers about the individuals visiting their sites. While some experts believe that the density of keyword ads at Google produces ad yields as high as $95 per thousand impressions, the commoditized nature of newspaper banners typically keeps their rates at $12 to $15 per thousand impressions. Because publishers often are unable to sell substantial portions of their inventories, they are forced to fill the space with remainder ads that typically deliver only $1 to $2 per 1,000 impressions. The final reason newspapers are trailing the over-all digital market is that most of them have what charitably could be called rudimentary mobile and video ad offerings. Because publishers have not invested in harvesting information from their users or modernizing the technology on their web and mobile sites, the only thing they have to sell are static and untargeted ad formats. Given all of the above, the most logical explanation for the steady and continuing erosion of the newspaper industry’s share of the digital market is that a growing number of sophisticated local and national marketers aren't very interested in dollar-a-holler web and mobile advertising. It’s none too soon for publishers to resolve to do better in the new year. Happy holidays. When the iPad debuted in 2010, I began urging newspaper publishers to defend and extend their franchises by developing innovative products to attract new audiences and new revenues on this transformational platform. But I always got the same question: Who else is doing it? For a year, I didn’t have a good answer, because publishers either ignored the most rapidly adopted electronics product in history – now owned by roughly a quarter of the population, according to the Pew Research Center – or slapped together retro renditions of their websites or print products for this state-of-the-art environment. A miracle occurred in the spring of 2011, when the Orange County Register introduced a spritely, purpose-built app called The Peel that, exercising the full multimedia and interactive capabilities of the iPad, was explicitly designed to be as un-newspapery as possible. The miracle was short-lived. A little more than a year after it was launched, The Peel was killed when the newspaper changed hands and the new owners throttled back most of their digital initiatives to double down on print. It’s too soon to assess the wisdom of the bold, if counter-intuitive, print-first strategy at a time when the digital media vigorously are siphoning readers and revenues away from newspapers. While we wait to see how that plays out, the tale of The Peel offers an excellent case study of the good, bad and ugly aspects of innovative product development in the legacy newspaper environment – a skill that every publishing company needs but few have mastered. Although the app intentionally was designed to be nothing like the newspaper, it initially carried the Register’s name and was marketed primarily through the print and web editions of the paper. This led to two big problems, which immediately came to light in focus groups. First, the app, which largely had been downloaded by the over-50 folks who make up half of newspaper readers, hadn’t attracted the desired audience. Second, the early-adopters were angry that the app lacked the traditional newspaper content they were expecting to see. Renamed The Peel within three months of launch, the product generated a few hundred thousand dollars of revenues in the first year but it wasn't making money, said Bennett, who is prohibited by his severance agreement from discussing financial details. Although Bennett said the losses were in line with those anticipated in the two-year launch plan adopted at the outset of the project, The Peel was scrapped when the company switched its focus back to print. ∷ Get the CEO’s backing. “Have a plan that the CEO buys into, supports and guarantees,” said Bennett, so he or she can “run interference” with finance, the newsroom, the ad sales department or anyone else who wants to kill the project if it is losing money in the early days – as almost all new ventures do. What’s next for press? They don’t know, either. For those in blissful oblivion or simple denial, the Columbia Journalism School has issued a valuable essay describing how digital technology and empowered consumers are eroding the commercial institutions that historically supported journalism. As a backwards look at how the contraction of the legacy media business has affected – and will continue to impact – journalism, the essay makes for worthy reading. But it comes up short in terms of providing actionable recommendations for those of us who are worried about what will happen to our democracy in the absence of news organizations that adhere to the generally accepted professional standards of rigorous reporting and fair-minded presentation*. C.W. Anderson, Emily Bell and Clay Shirky, who authored the essay called “Post-Industrial Journalism: Adapting to the Present,” can be excused for not solving the problem of who will pay for journalism when we don’t have newspapers or the other legacy news media to kick around any longer. With journalism turned into a free-for-all where anyone with a video camera or an iPhone can hijack the news, we are facing, if not always bravely, a new world that is utterly uncharted. Inasmuch as we can learn a lot from history, the most valuable part of the essay (free, here) is its exploration of why nearly all of the immensely powerful and stunningly profitable legacy media companies failed to appreciate and respond to the changes in the media landscape wrought by the Internet and the myriad publishing platforms and formats it has spawned. In a word, the reason the traditional media institutions are faltering – and they are faltering and will continue to falter – is inertia. The companies now sagging under the digital onslaught were organized in the eras when their printing presses and broadcast licenses gave them highly defensible and superbly profitable advantages over any would-be competitors. These companies were – and, understandably, continue to be – focused on extracting the greatest possible profits from those advantages. The legacy companies had every reason to disdain – and no incentive to embrace – the power that digital publishing has conferred on every wired consumer to get and give news in the time, place and fashion she wants. Rather than adapt, the legacy institutions doubled down on the business models that leveraged their monopoly and near-monopoly status to charge premium prices for advertising to the largest audiences they could assemble. This unfortunately puts the legacy media distinctly at odds with modern marketers, who want to spend the least money possible on putting the right message in front of the right consumer at precisely the right place and time. The challenge of change is underscored by the essay’s lack of big ideas about how to transition journalism to a solid footing as the legacy institutions implode. 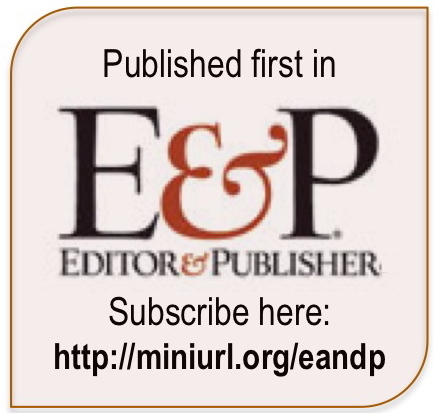 After several hundred words describing the enormity of the challenges facing the legacy media, the essay provides rather modest recommendations for editors and publishers, such as improving transparency in news-gathering; upgrading content-management systems, and publishing data and other raw source materials – not that there’s anything wrong with any of that. 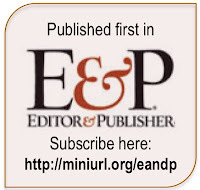 The authors make a strong, repeated and welcome case that legacy media should partner with individual citizen journalists and next-generation journalistic enterprises to provide fuller and more inclusive reporting. “Give up on trying to keep brand imprimatur while hollowing out product,” the authors wisely advise. As luck would have it, Jan Schaffer of the J-Lab at American University in Maryland, published immediately after the release of the Columbia report an excellent, must-read study (free, here) of the successes and failures of nine projects where legacy media companies attempted to partner with various nascent journalistic ventures in their markets. Funded three years ago with $500,000 from the Knight Foundation, the J-Lab effort produced “five wins, two hits and two losses,” said Schaffer, who ran the program. Looks like we have more work to do. * Yes, I know there are many who feel that the media are as corrupt as any other institution, but all the journalists I know take their missions and responsibilities seriously, acting ethically in the public interest to comfort the afflicted and afflict the comfortable. For all the flaws of traditional journalism over the years – and there are plenty, ranging from racism and sexism to the Jayson Blair scandal and the WMD fiasco – the republic never has gone without a press powerful enough to pry into official misconduct or peer into the problems of society. Absent a financially strong and independent press, I fear the conversation will be taken over by crackpots, commercial interests and political partisans. Those rooting for the demise of the professional media ought to be careful what they wish for. It won’t be pretty.